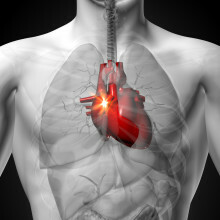 In patients with coronary artery disease (CAD), the type of chest pain known as angina is a sign that blood flow to the heart muscle is being compromised. When a coronary artery becomes 70 percent blocked, angina predictably occurs with exertion and resolves with rest. This is called stable angina.